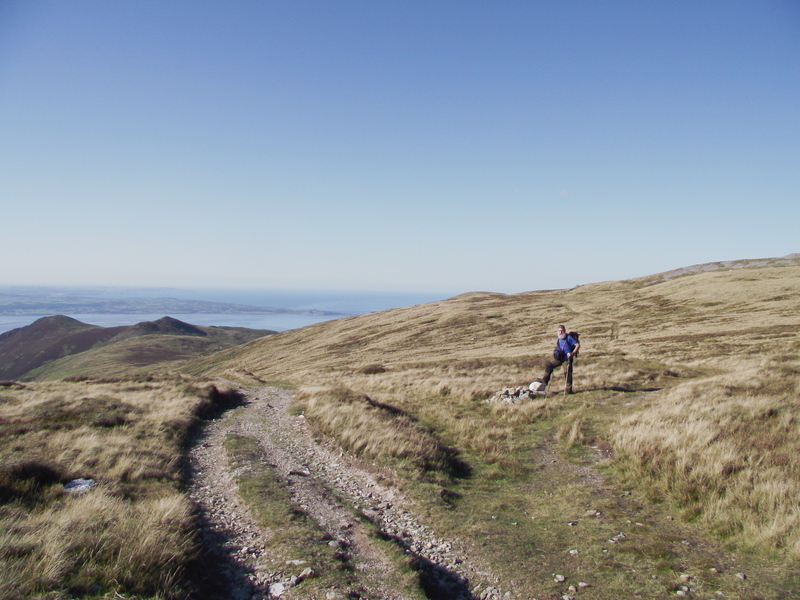 Whichever way you look at it, the Carneddau range of mountains in North Wales is big – it is, in fact, the largest land-mass south of Scotland that is over 2500ft high (762 metres) in height. 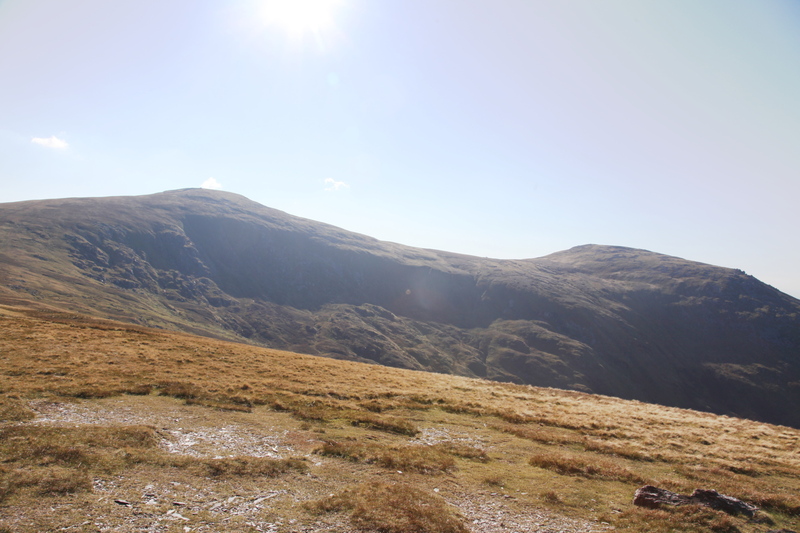 Although there are many fine mountains in England and the rest of Wales, there is nothing quite as wild (or perhaps intimidating) as the Carneddau, and I am a recent convert to these high, lonely mountains. 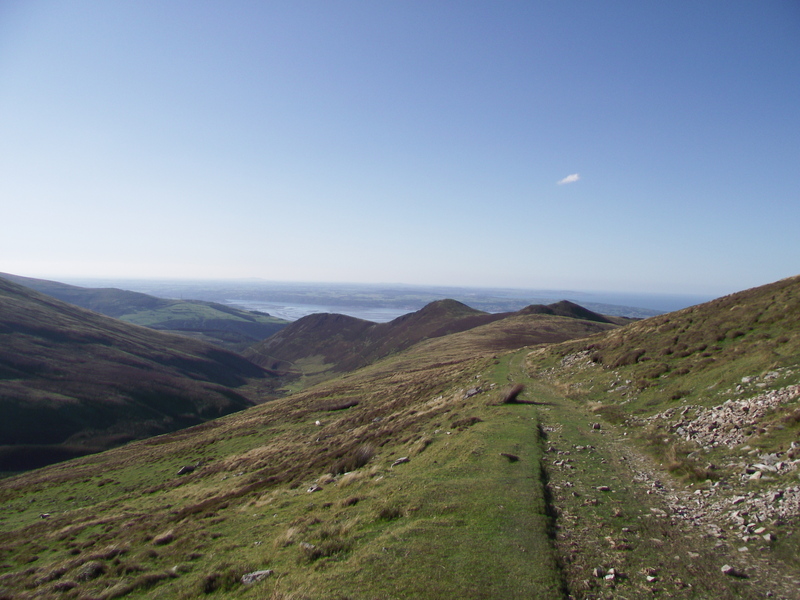 The range includes seven out of the fifteen peaks in North Wales that are over 3000ft (914m), as well as a couple of major climbing crags. 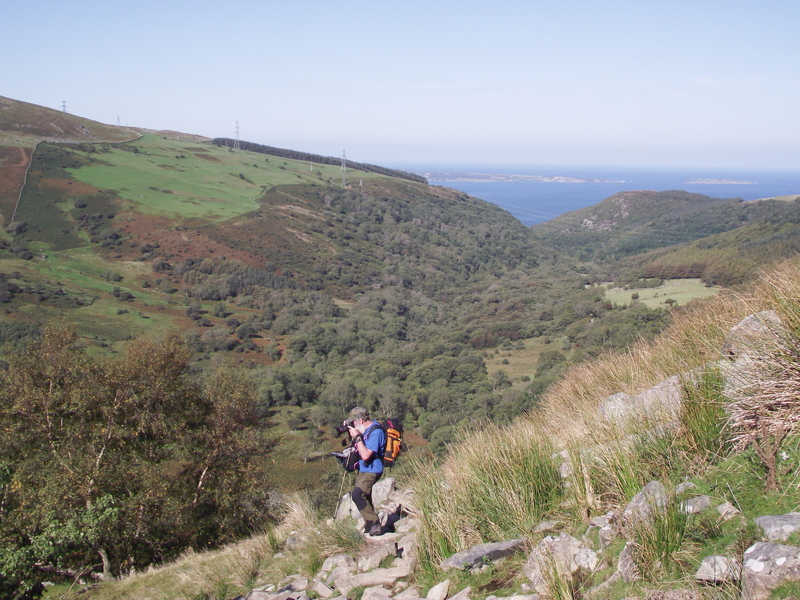 There are several ways of accessing this high ground, but in the past I have approached from the mountain valleys – this time the plan was to start near the village of Abergwyngregyn on the north coast. 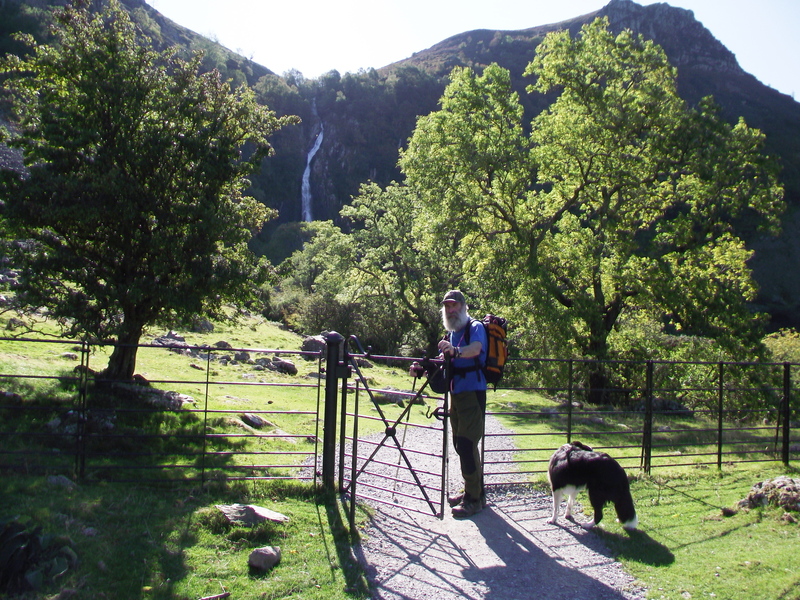 The route starts through pleasant woodland, where the first feature of note is what the English know as Aber Falls, but what the Welsh call Rhaeadr Fawr, the ‘Big Waterfall’ – at 120ft (37 metres) it doesn’t disappoint. 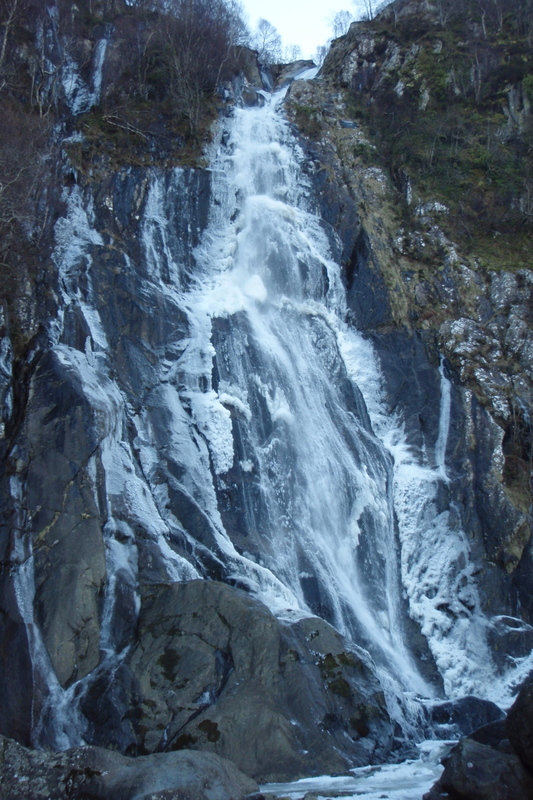 Aber Falls in winter – 120ft of ice. 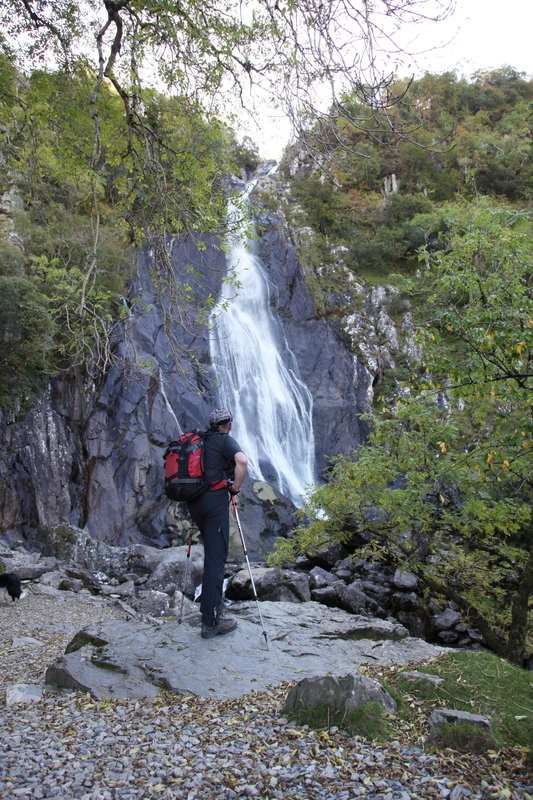 A subject as photogenic as Aber Falls would distract someone with a humble disposable camera, so when your walking companion has several hundred pounds worth of Canon camera (plus spare lenses) you can expect to spend a little time here. My camera toting mate, John Bamber, was having a great time, and my Border Collie ‘Mist’ was milking the opportunity to be a model, so it was ‘chill out’ time. 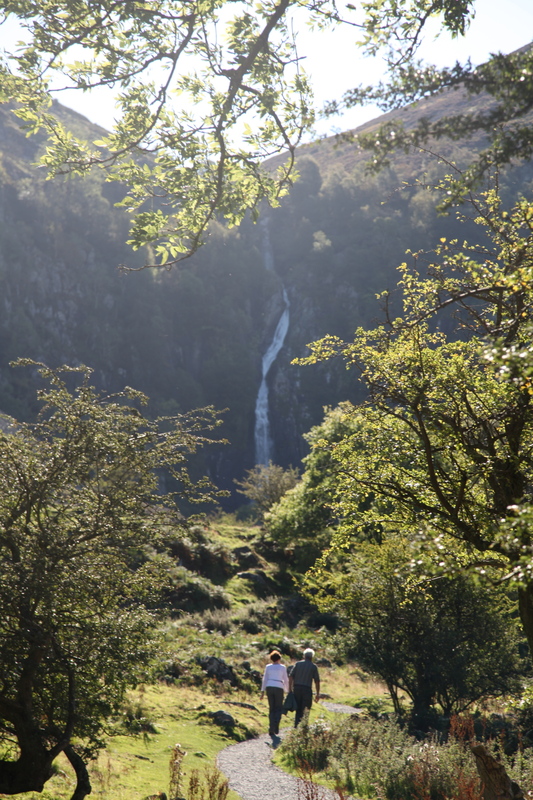 When we did get moving, we followed a path rising alongside the falls. A short rock step provided some interest at this point, with a short wet section that required a little care – in winter this would probably require crampons, but even without ice the slippy rock and the looming drop below concentrated the mind somewhat. Then suddenly, we were in a high mountain valley. 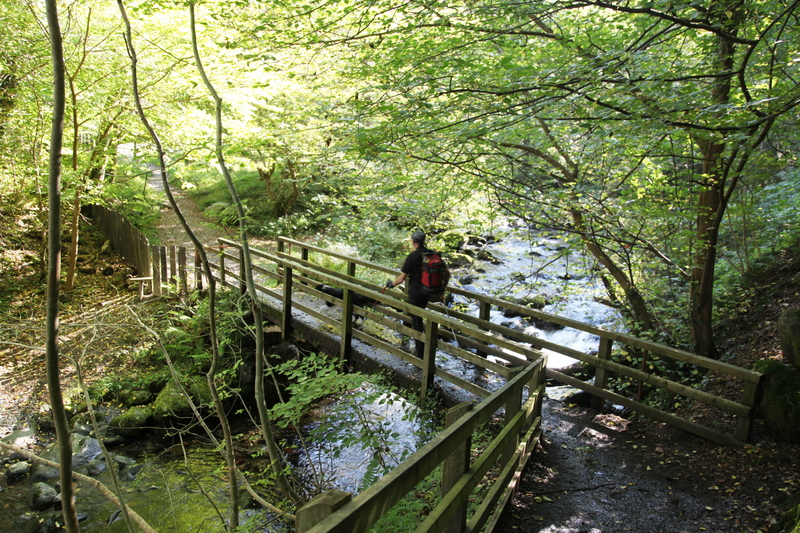 The valley provided pleasant walking with the Afon Goch (‘Red River’) as company. 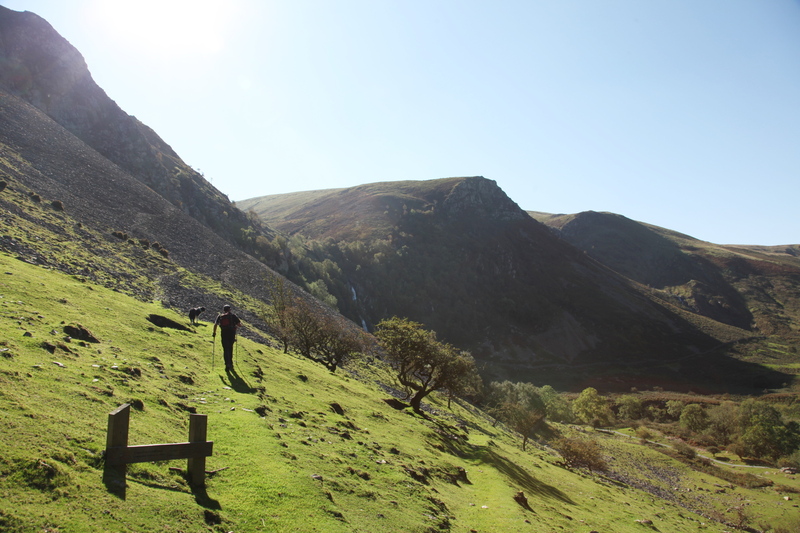 At an ancient sheepfold the mood changed, with a steep climb up the slopes of Llwytmor Bach. 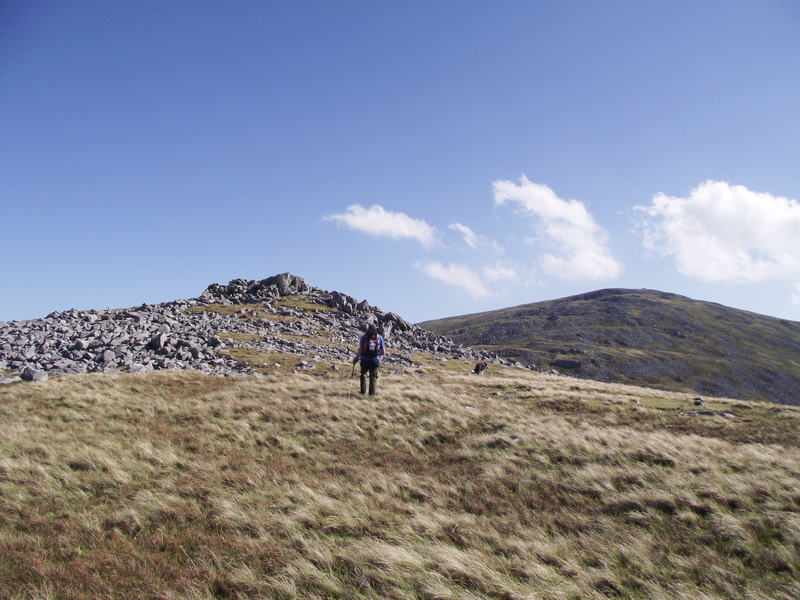 From there a short drop in height led us on to the main summit of Llwytmor (849 metres). One internet reference states, “This peak is very unfrequented” – I should say so! 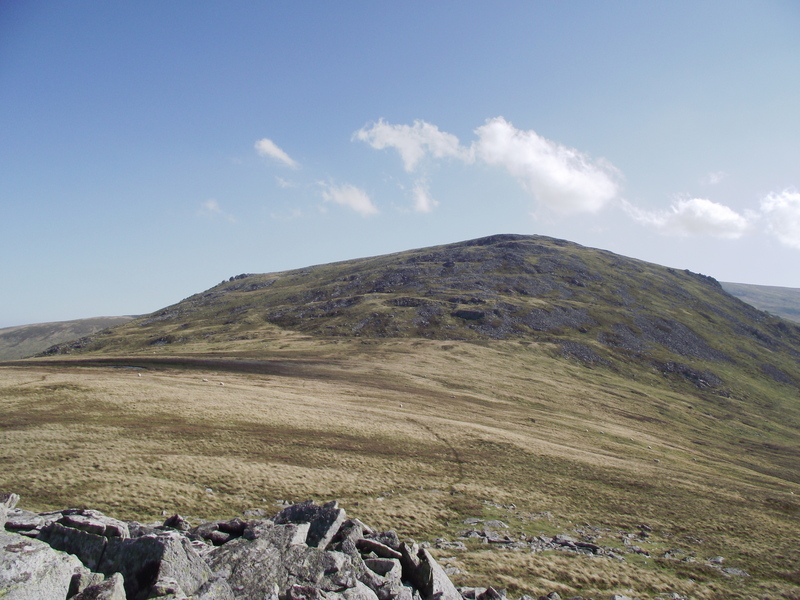 Here at last we had a good view of our high point of the day, Foel Fras (942 metres), though unfortunately there was a height loss of 70 metres between the two. After regaining the height, and picking our way through the summit boulder field, we arrived at last at the trig point at the top. From the waterfall the ascent had been fairly unrelenting, but from Foel Fras it was downhill all the way. 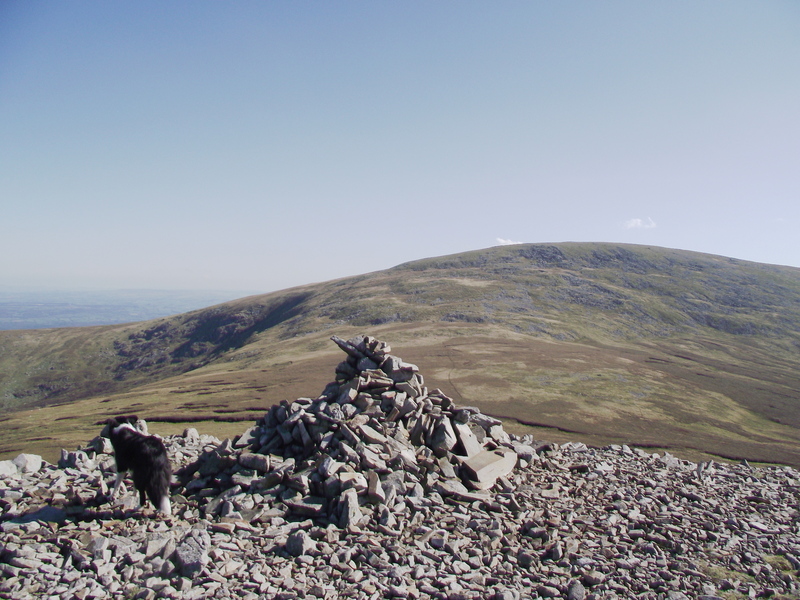 On the way we picked up another summit, Drum (770 metres), marked by a fine, ancient looking cairn and a new metal gate. From here a Landrover track allowed swift progress. 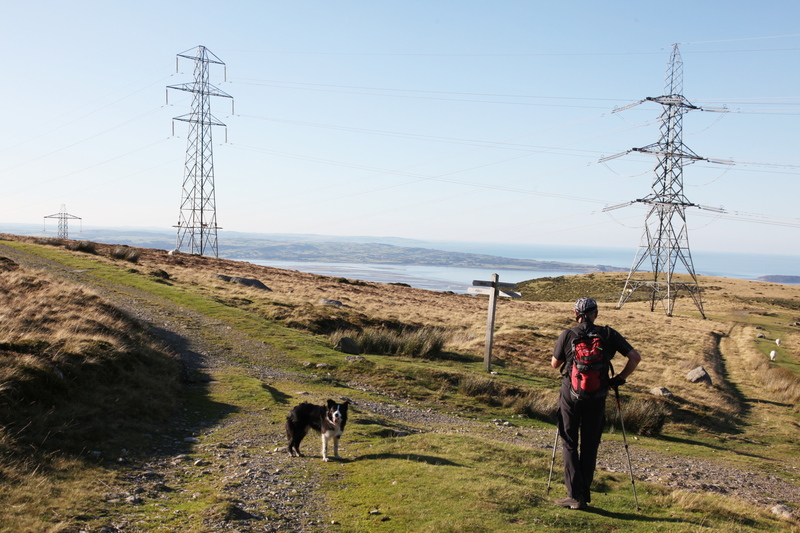 At about 540 metres altitude we had the opportunity to leave the track to follow a narrow path over Pen Bryn Du, leading to the trio of small linked summits of Yr Orsedd, Foel Ganol and Foel Dduarth, but we left these for another day. 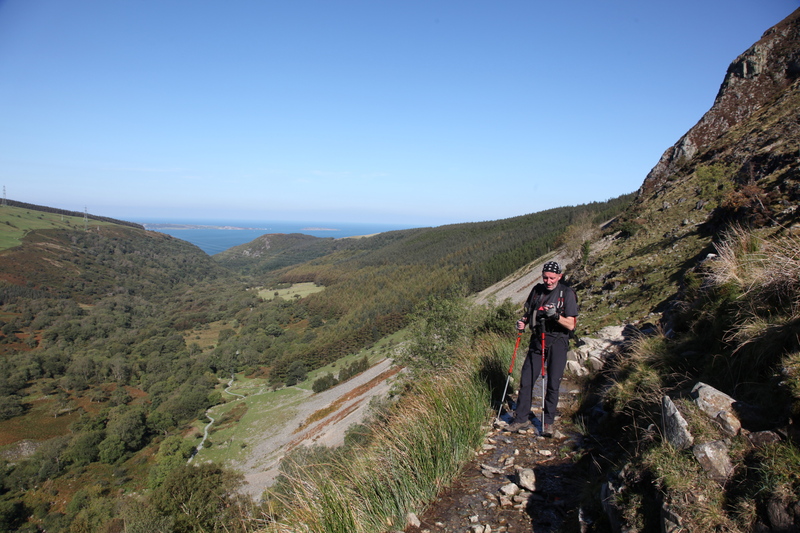 Instead we carried on down to the junction with the “North Wales Path”, leading us back to our start point – the can of cold cider in the camper fridge didn’t touch the sides on the way down! p.s. 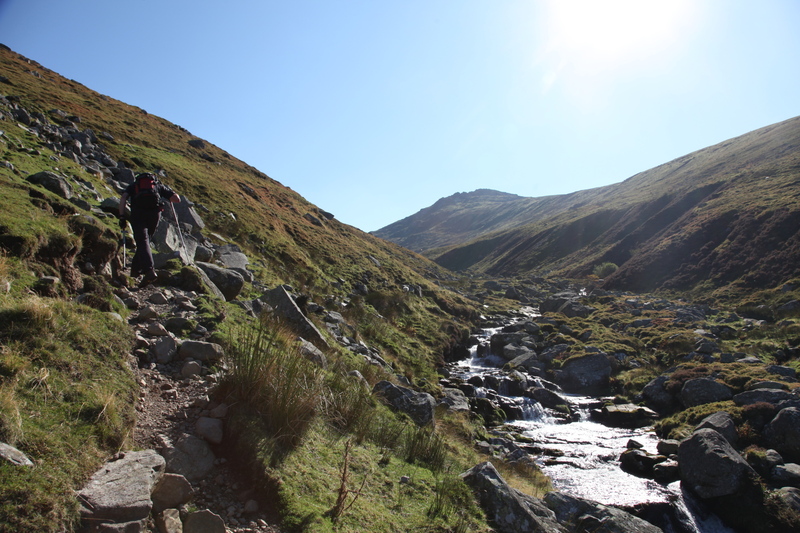 Come back next week for a walk over the Glyderau, from Ogwen Cottage to Capel Curig – another warm one, so bring your own cider! This entry was posted in 5. 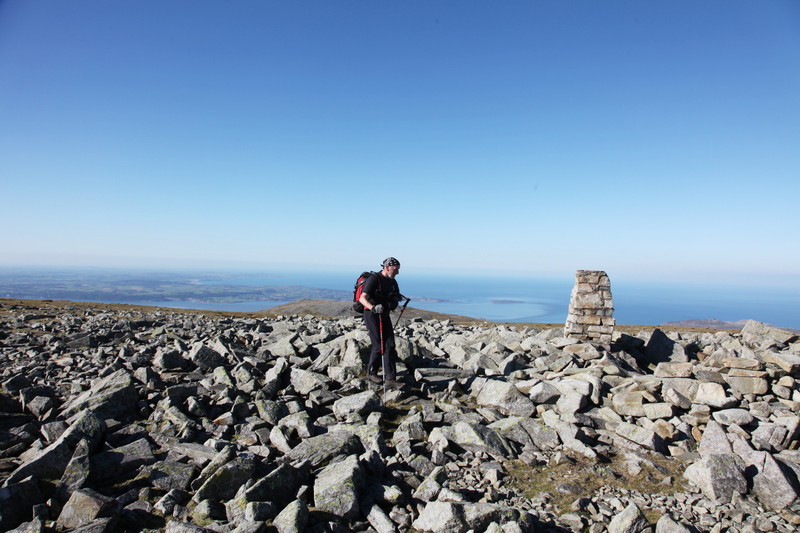 North Wales and tagged Carneddau, Foel Fras, hillwalking, mountains, Snowdonia. Bookmark the permalink. enjoyed the walk, paul, on a fine day by the looks. particularly liked the one tiny cloud above the three peaks. thanks. Hi Stan, and thanks for the kind words.